This is the question most photographers are asking right now. I hear the buzz all over social media. And the answer is: NO. 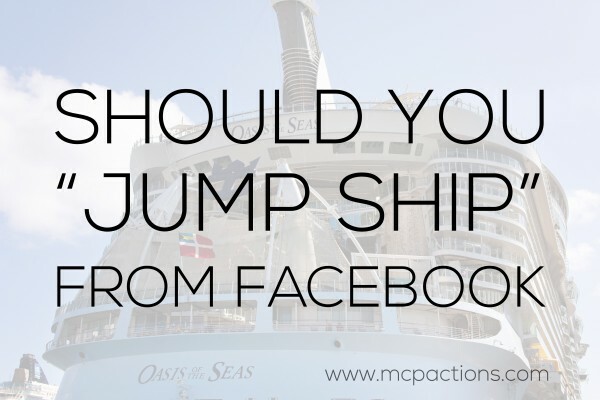 Don’t jump ship from Facebook. Just change the way you use it. Times have changed — you may feel like less people see your images and posts, no matter incredible the photos or exciting the conversation. Facebook constantly changes their algorithm. They need ad dollars to please stockholders, and unfortunately this leaves less space for the content you want to deliver and receive. Create great content, share beautiful images, and post what your audience wants to see. Experiment. Each week design a plan and stick to it. One week try the “post only once a day” and another week try to post every few hours throughout the day. See what works best for your audience. Check your insights and see what types of posts do best and do more of them. Don’t take it personally – don’t measure your worth by your numbers. It’s not you, it’s them. If you start feeling down about yourself, take a step back. Maybe take a few days off, or even have a friend post for you. Seriously. Your photos rock! If you see a low percent of people seeing your posts and the decreased amount of interaction, remember that Facebook is holding back. The bigger your Facebook account gets, the lower the % they show your posts to organically. So, consider finding your ideal target customers, not just bodies, to like your page. Be careful of “the experts.” Much like an overweight person who wants so badly to lose weight, it’s easy to fall for the “free” webinars promising more fans and interaction on your page. Most are designed to lure you in to paid products. Since social networking changes constantly, I’m skeptical of people who coin themselves “experts.” Maybe “experimenters” is a better name – they try and tell you what they think works at that moment in time. 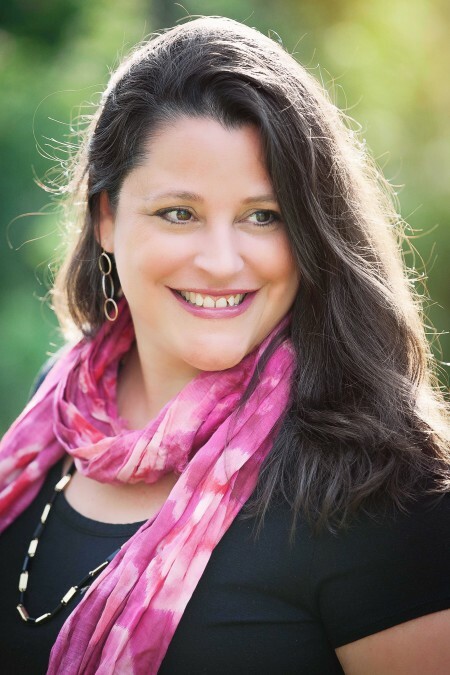 What else you can do… The best advice I have for photographers! This is the same advice I might give a kid on Easter. 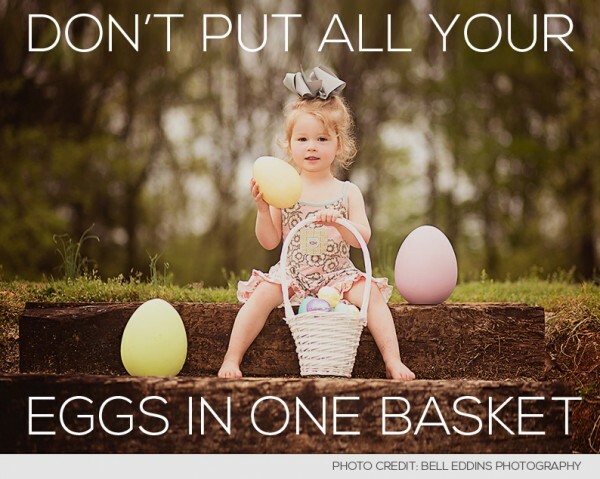 If the wind blows and you drop your basket, you lose all the eggs. Start thinking in terms of diversity. Sure, you can have a favorite social network. Your heart may even still belong to Facebook. Ownership is everything! The most important thing isn’t what social networks you belong to, but that you take ownership of a website, a blog and a newsletter. You control these 100%! Then diversify your social networking efforts. It may be impossible for your business to be on Google Plus, Facebook, Instagram, Pinterest, etc. But we recommend pick at least two or three so that you spread out and reach your customers where they like to socialize. Now it’s networking time!!! Who wants to play…. Below, we listed all the places where you can find us. We definitely do not expect you to follow us everywhere, but we hope you’ll like us on any networks that you frequent. We even added a description of each so you will know which are best for you. Oh, and “networking time” – you may wonder what that means. We want you to tell us where we and other MCP fans can find you too. Just type your info in the comments section below. MCP Facebook Page – We share tips, tricks, and news related to photography and editing. MCP Facebook Group – Request your invite to connect with MCP customers around the globe. Ask questions. Share your edits with our products. MCP Google Plus Page – We share tips, tricks, and news related to photography and editing. See MCP posts that Facebook hides from you. MCP on Instagram – We get a little more personal here – but also host a fun, photo a day challenge. Come join us when you can. MCP on Pinterest – We share tips, tricks and news related to photography and editing – some from our sites and other stuff from around the Internet. MCP on Twitter – Like your information in 140 characters or less. Join us here for quick tips and links to new blog posts. Store – Shop for Photoshop actions, Lightroom presets and editing classes. Blog – Learn photography, Photoshop, Lightroom, and business tips and tricks. MCP Show and Tell – See before and afters with step-by-step recipes teaching how to get the look. Then share some of your own. Weekly Newsletter Sign Up – Don’t miss a beat. We deliver photography and editing tips and tutorials right to your in box. Plus the occasional freebie and new product details. Love the advice, I was just thinking the same about facebook… hopefully the changes are good. thanks for the advice. I consider Facebook and Google+ to both be important. I have noticed improve Google search ranking via my Google+ posts, so I will always keep posting to both locations. Good information. But just once I wish people would give you ideas on how you are supposed to know who your audience is when your business is online. I am from Utah, there is another Candice Ann Photography in another state. My business would not exists without Facebook. No amount of paid advertising in any venue, word of mouth or other forms of networking would put my work in front of so many dog owners. I share my things to the client’s wall and all their friends see it, etc. I hate FB. Unfortunately, it is a necessity still. I do suggest that everyone have a free MailChimp account and send out newsletters to get their customers attention. Have a giveaway, discount, are some surd of contest to reward those who sign up for your newsletter. Then take that link, or even make it into a graphic, and spread it through every social media outlet you can, and more than once. This is especially good to do holiday times, such as Easter. Growing your newsletter recipient list will help you engage and grow a fan base, that took the time to sign up to find out more about you, instead of just having one of your photos or graphics float by them on a FB page, if you’re lucky. MailChimp is the most customizable of the free email newsletter programs out there, but if you have a hard time with that one, Mad Mimi is a super second choice. Anyone can do it, I promise! My wife Nicole runs the main Facebook page for portraits & newborn work, and I try and keep the other networks fresh with new photos as often as possible. If anyone is on G+ stop over and say hi, that’s my preferred network by far! I also utilize http://fotost.at/ to schedule posts and save time. I’m at Nicole Klym Photography on Facebook and Google+ and @NKlymPhoto on Instagram! Valerie Bybee Photography on Facebook. and also ValerieBybeePhotography on Instagram.